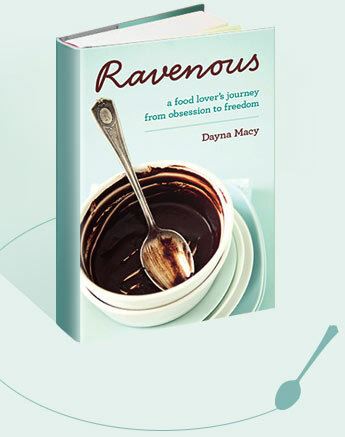 About — Dayna Macy, author of "Ravenous"
Ravenous: A Food Lover’s Journey from Obsession to Freedom tells the story of how I made peace with my appetite and my body. That journey, and the one I traveled to become a writer, both took a while. I’ve wanted to write a book since I was 12. I was born in Rockland County, New York. I went to college at Drew University, and then to graduate school at Brown University, where I got my degree in philosophy. I thought I wanted to teach but realized what I really wanted to do was write. I wasn’t quite ready to hang out my writer’s shingle, though — so instead, I decided to get a step closer to writing by getting into book publishing. Most people don’t leave New York to start a publishing career, but that’s what I did. I made my way to Berkeley in 1986 and landed my first publishing job at Ten Speed Press. The company’s subversive nature appealed to my own. A job in publicity opened, and I sprinted out of that receptionist’s chair as fast as I could. The first book I worked on was White Trash Cooking, a gorgeously written ode to poor Southern food that spent many weeks on the New York Times bestseller list. After Ten Speed, I directed public relations for various Bay Area media companies, including Collins Publishers San Francisco, Nolo Press, and Salon.com. These jobs gave me great and weirdly diverse experiences, from working on former Black Panther Bobby Seale’s cookbook, to publicizing basketball great Michael Jordan’s photographic autobiography, to taking a new-media website public. Along the way, I began studying yoga, which changed my life. In 2001, I joined the staff of Yoga Journal as communications director, and in December 2008, I also became managing editor of Yoga Journal’s international editions. I was a publicist by day, and a writer by night. I began writing articles for Self, Yoga Journal, Salon.com, and other publications, and then my essays started getting published in anthologies. I’ve been lucky: I have great fun bringing national exposure to wonderful companies. And I love the short form of essay writing. But I could not forget about that book I’ve wanted to write since I was twelve. “Write what you know” is common advice. That makes a lot of sense, but I never followed it. Instead, I write so I can figure out what I think. Today, I live in Berkeley, California with my husband Scott and our sons, Matthew and Jack.